Michael: A reader wrote and asked us about weddings in Colombia. I have to admit the subject is not high on the list of things that occupy major chunks of my thoughts. Perhaps it is because generally such subjects hold a higher consciousness in the minds of women than in men. My experience is limited to attendance of only four weddings in the Bogotá area. But I do have my wife and friends who have lived in the country all their lives and attended many weddings. With their help is presented a basic idea of the similarities and differences. Graciela: Like the United States things change depending upon the financial conditions of those paying for the event. Generally the bride’s family is responsible for everything. Though more and more couples are marrying at an older age and footing the bill themselves. These events are expensive so it is not unusual for either the parents or the new couple to get a loan to make the day special. Michael: Ninety-five percent of Colombians are Catholic. But Notarios (kind of the equivalent of a notary but one who must be a lawyer) also perform marriages. I was told recently that if a couple is married in the church they must also go through a ceremony with a Notario in order for everything to be legal. That has not always been the case. However two people have told me of having trouble later in life because the church did not register the ceremony with the authorities. Most often these are simple affairs done in the Nortaria office. But many of these officers of the law will perform the ceremony in other locations. Pedro, the Notario in the town my wife and I lived, performed our ceremony at the house of our friends. He did an excellent job giving a speech that moved everyone emotionally talking about love, respect and a life together. In fact Pedro does such a great job, especially compared to other Nortarios, that he officiates at many marriages between a Colombian and a person from another country. One day Pedro told me that the national government agency audited him because he did so many weddings with foreigners. Graciela: Now let’s take a look at some of the differences between the two countries in regards to weddings. 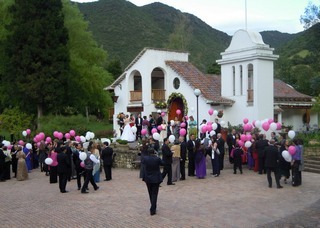 December is the month that most couples tie the knot in Colombia. That is because it is about the only time of the year that they have off from work. Michael: In my opinion Colombians have fewer guests at their weddings than Americans. To be invited is considered a great honor. Usually there are no more than 50 to 100 people. In my later years living in the United Stated I noticed a lack of dress code by wedding attendees. Not only did many of the invited not wear a suit or even a tie, but some showed up in blue jeans and T-shirts. Since it is considered an honor in Colombia, the attendees take special pains to dress up. My wife’s and my wedding was just with a Notario at a friend’s house. Yet, all the women wore a nice dress and every man had a suit. At a recent wedding of a friend of ours (some photos included here) every male attendee wore a tuxedo. Graciela: Location can be slightly different from the USA. Earlier Michael wrote how some fincas (small farms) near the city had opened up restaurants. Well, another business is weddings. Many of these places already had a chapel on the grounds which can hold perhaps 50 – 70 people. Then the homes were large enough to hold many guests. No longer a working farm with 50 to 100 employees these old places are now designed for weddings. They handle everything from the ceremony to the reception. The scenery is usually quite beautiful and much attention is paid to detail to make the day perfect for everyone. This is a country of flowers. In a previous piece we wrote how the majority of Valentine’s Day roses in the USA come from Colombia. At these weddings flowers are abundant. It is not unusual for the bride and groom to walk down the isle on, not just a few, but a thick bed of rose pedals..
Michael: This next part has gotten some gringos in trouble when they plied the bars of Bogotá. Ninety percent of married Colombians wear the wedding ring on the ring finger of the right hand, not the left. No one has ever been able to explain to me why that is tradition. Graciela: Colombians are very etiquette minded. 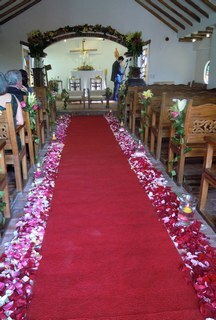 Usually each guest couple receives a small gift from the bride and groom in appreciation and for remembrance of the day. Michael: I have not seen rice thrown at a wedding. But in some cases the guests are given helium filled balloons with a small card attached to it by a long ribbon. Guests write their wishes for the happy couple on the card. Then all the balloons are released into the air simultaneously. The card attached to this balloon wishes the new couple much happiness and a baby. This is great information but I need pictures of what women guests are wearing. The bride says her family will be wearing long dresses. I have none. I do have a nice skirt and fancy top that I wore to their wedding when they got married in the USA. I was probably a little overdressed for that wedding but it may be inappropriate for the one in Colombia. The groom is American; the bride Colombian. Thanks for your help. Thank you for stopping by our website and dropping us a message. The correct dress is often dependent upon where in Colombia the wedding is held, whether hot weather or cooler. Long dresses or skirts with a jacket are pretty much the norm in the weddings we have attended. But Colombians are very warm people and will not embarrass you if you wear a shorter skirt. That said, we should add that you might immensely enjoy arriving in Colombia early and shopping at many of the stores. It is easy to find beautiful long dresses at good prices. The reason for this is that Medellin, Colombia is a fashion center annually hosting a fashion show for South America. We know women who live in such fashion places as Paris and Singapore who come to Colombia to purchase their dresses. Janet, I have the same question as you. I was told a “long dress” but how long I don’t know. How did you make out?